1. How faint are the farthest objects? The Hubble observations detected objects as faint as 30th magnitude. The faintest objects the human eye can see are at sixth magnitude. Ground-based telescopes also can detect 30th-magnitude objects. Those objects, however, are so dim they are lost in the glare of brighter, nearby galaxies. Searching for the faintest objects in the Ultra Deep Field is like trying to find a firefly on the Moon. Light from the farthest objects reached the Hubble telescope in trickles rather than gushers. The orbiting observatory collected one photon of light per minute from the dimmest objects. Normally, the telescope collects millions of photons per minute from nearby galaxies. 2. How many orbits did it take to make the observations? It took 400 orbits to make the observations. 3. How many exposures were needed to make the observations? The Hubble telescope's Advanced Camera for Surveys' wide-field camera snapped 800 exposures, which equals two exposures per orbit. The exposures were taken over four months, from Sept. 24, 2003 to Jan. 16, 2004. 4. How much viewing time was needed to make all the exposures? The 800 exposures amounted to about 1 million seconds or 11.3 days of viewing time. The average exposure time was 21 minutes. 5. How many galaxies are in the image? The image yields a rich harvest of about 10 000 galaxies. 6. How many colors (filters) were used to make the observations? The colors used were blue, green, red, and near-infrared. The observations were taken in visible to near-infrared light. 7. 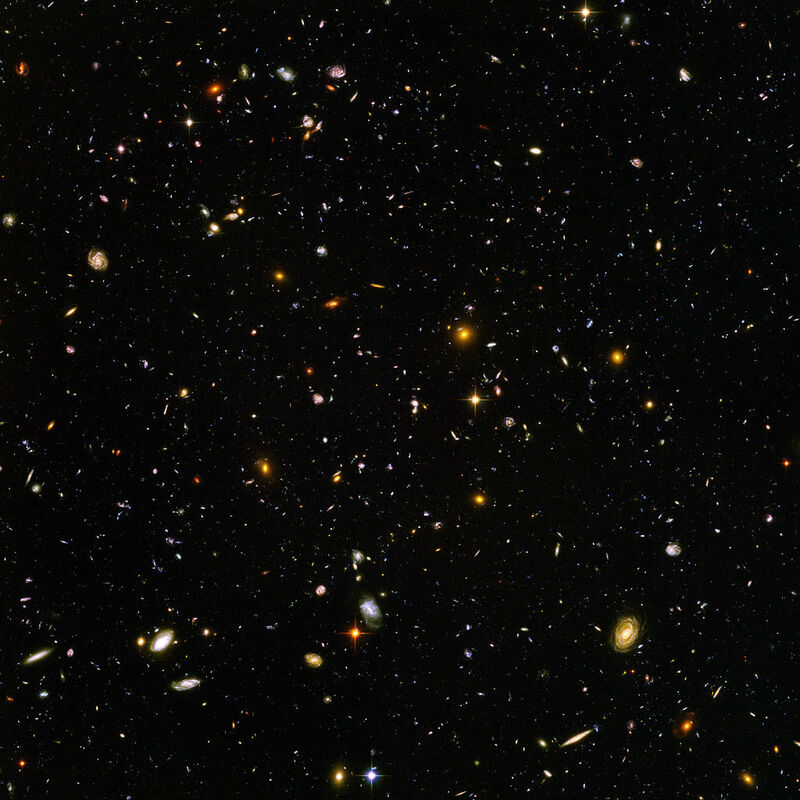 If astronomers made the Hubble Ultra Deep Field observation over the entire sky, how long would it take? 8. How wide is the Ultra Deep Field's slice of the heavens? 9. How sharp is Hubble's resolution in pinpointing far-flung galaxies in the Ultra Deep Field? Amazing and wonderful. All the universe is alive. Solar wind, cosmic dust, the skeletons of planets, osmosis, and more than anything we can image.